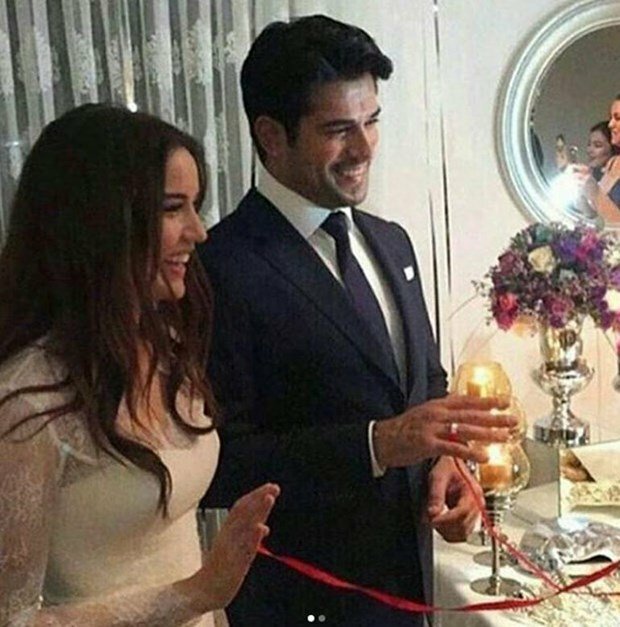 Burak Ozcivit went to Solingen, Germany to ask the consent of Fahriye Evcen’s parents for marriage. The groom and his parents visited the girl’s family to ask the hand of the bride-to-be and the blessings of her parents upon the upcoming marriage. 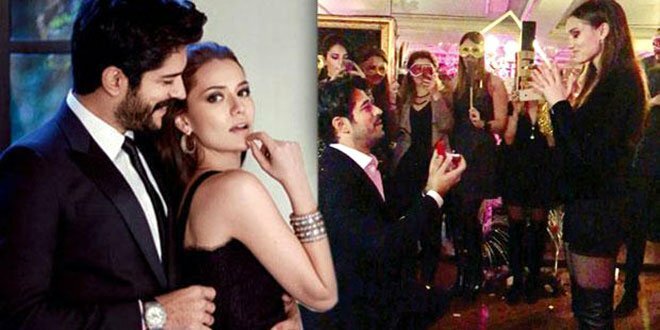 In order to go to Germany, Burak Ozcivit has got permission from his director of Blind Love (Kara Sevda) while Fahriye Evcen has got permission from her director of To Death (Olene Kadar). The couple wanted to keep it confidential by demanding leave for personal reasons. The couple went to Solingen, Germany together and got engaged after getting consent of their parents. The couple plans to get married in June 2017. Next The Popular Turkish Drama Silver (Gumus) to Air in the U.S.
From America with love to both Burak and Fahyire the most beautiful people. I am hooked on Turkish T.V. your actors are well trained and do not rely on gimmicks, cinema tricks but real classical training. I see a little girl in the near future for both of you. I ,too, am from theater training in the USA and totally agree with you analysis of Turkish T. V. Quality has a universal appeal! I live in Italy, and have worked in television and radio. I first got hooked on Cherry Season, then realized that Mediaset had purchased the rights ..so since I speak italian I could follow along. Following an Italian production of Honor and Respect, I noticed, lots of pretty faces but not much talent behind the main actors..Then I say Kerem Bursin & Sükrü Özyildiz in the Turkish version of the same story. Since that time I have discovered websites with english subs as well as a host of other fantastic classically trained actors.. I find it difficult to watch TV in the same way. I am busy but I always find time for great acting I just finished Calikusu ( I am still perplexed by the ending..) Paramparça and Kara Sevda. I must say that Burak and Fahyire (TV e film performances ) give the kind of excitement and energy of Liz Taylor and Richard Burton or Spencer tracy and Kathryn Hepburn… This quality of acting has been missing for quite a while. Gina Lolabrigida states that, years ago they spent 2 weekes to shoot 2 hours worth of material, meanwhile the actors studied, honed their skills with dance and singing. She sadly sad that now its seems 2 hours of shooting to be spread over 2 weeks of viewing. We can see the difference onscreen and with the general script writing. My best to these 2 excellent, artistic and highly crafted professionals onscreen and off. I enjoy the way especially Burak interacts with a great deal of respect the crew and public. I have never been a binge watcher or watched much TV. Recently, I started watching Turkish movies, and i cannot leave my TV or my computer, anxiously waiting to see the next episode. I stated with Kurt Seyit and Sura. Next, I watched Lovebird, .only to find out that the series was cancelled, and I cannot see the end. This is so disappointing as the acting is superb,and the actors are magnificent. Burak and Fahriye are just incredible together. They outdo American or English shows, and one just wants to watch more and more of their charisma. How do I see the end of the story of Lovebird in English? Please keep producing more ,and more of these wonderful love stories. I have never been a binge watcher, or watched much TV. Recently, I started watching Turkish movies, and I cannot leave my TV or my computer, anxiously waiting to see the next episode. I started watching Kurt Seyit, and Sura.Next, I watched Lovebird,only to find out that the series was cancelled, and I cannot see the end. This is so disappointing as the acting is superb,and the actors are magnificent. 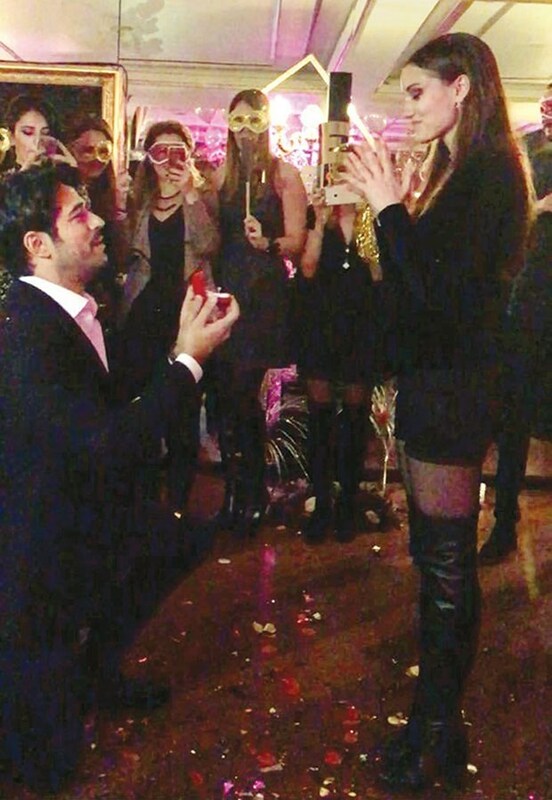 Burak and Fahriye are just incredible together. They outdo the American and English shows, and one just wants to watch more and more of their charisma. How do I see the end of the story Lovebird in English? Please keep producing more and more of these wonderful love stories with these two very special stars.